This extraordinary book, published in 1949, tells the stories of the trials of a number of British subjects who betrayed their country during the Second World War. 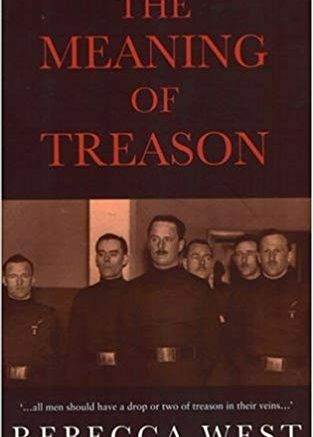 The bulk of the book is a long chapter on the trial of William Joyce, the Irish-American who spent the war years in Berlin, broadcasting Nazi propaganda as “Lord Haw Haw”. West is a very good writer, so her account of Joyce and the others is more than just the story of a trial. She grapples with the question of why someone would betray their homeland, their families — though in some cases, especially in the final chapter on what she calls “the children”, she questions the trial itself and the sentence imposed. The traitors, Joyce first and foremost, come across as human beings. They each have an individual history, often a sad one, and their decisions to sign up to support the Third Reich did not come from nowhere. But that doesn’t justify anything any of them did. They all should have — and probably did — know better. Found guilty of treason by an English court, William Joyce was hanged on 3 January 1946 at Wandsworth Prison.